May be used if citation and link are posted. (subject to updates). Lebanon, Oregon 97355. At about 20:10, 9/21/2011, there was a blue in color ball shaped object falling in a diagonal line in the south easterly direction from my house. This object seemed to have a little tail or streak behind it. It appeared to be falling from the south to the north north westerly direction. I could not gauge how far away it was for all I know it could have landed as close as Middle Ridge of farther than I5 corridor. This was a spectacular sight! I am still mesmerized as I live in the country with little light around so the star show I have seen since 1995 from living here, this was the best! I have seen many many meteor showers and odd things in the sky before; this is the topping on the cake for the shows and wonders I have witnessed in the sky! I would like to know what is could have been. It looked as if wherever the object landed it would be smoldering or light some fuels on fire. I am a wild land firefighter and that object appeared to be the color of a very hot flame. Like when ink on paper or cardboard burns, that real pretty blue flame was the color of the object falling. Any information on this mysterious falling object would be much appreciated! Thank you for your time. -Tabitha S. Thank you Tabitha. approximately 8:20 spotted green meteorite falling from east to west. we were traveling on Stayton-Scio hwy looking toward mary's peak in the coast range when we saw the meteorite burn from approximately 80 degree's to 30 degree's on the horizon where it broke apart into a couple chunks and disappeared at about 30 degree's on the horizon. We were traveling west along the railroad tracks just before the road makes a wide loop and crosses the rail tracks about 2 miles out of Stayton. -Doug H. Thank you Doug! I live in a small town WA called Goldendale, around 8 weds night I saw a very bright, greenish-blue streak, at first I thought it was a shooting star, then it continued to travel downward from south to north across the western sky. It eventually went out of sight, but it probably was in my view for 2-3 seconds. I instantly ran in and told my wife about it. I am about 120 miles from Portland. I live in Vancouver, Washington in the area of Mill Plain/Andresen. At approx. 8:10 p.m. or so I was sitting in my living room (facing south) and saw a huge, bright "light" drop diagonally between 2 trees. I wasn't sure what it was...never seen anything so big. It looked like this was over the Columbia River, but of course that was just my perception. I heard this morning that it was probably a meteorite. -Dorothy Thank you Dorothy! We were traveling on Hwy 99 just past Hwy 18 going towards the town of Lafayette; it was after 8p.m. . I was driving and my husband noticed something falling from the sky. He pointed it out to me. We both saw it. It was quite large. It looked like something on fire, blue-ish flame falling from the sky. It was so close to us, we believed it fell in the field just to our left (between 99 and 18). I actually put my breaks on as we saw it approaching the ground; I was seriously expecting some kind of explosion after it hit, that’s how large it was. I know it sounds silly but we’ve never seen anything like it before and thought it was more like a rocket of some kind, possible home-made. After reading your blog I think we did see some kind of meteor. Just thought I’d share our story. Thanks, Melanie V., Amity. Thank you Melanie! I was driving southerly on 99 W headed back to Newberg, OR from Sherwood, OR, just about at Rex Hill. My son who was "riding shotgun" and I witnessed an amazingly bright white ball shooting downward in an arc, southwesterly. I put on the brakes right in the middle of the highway it was so astonishing, and I expected there could be a ground explosion of some kind - it was September 21st after 8:00 p.m. and before 8:30 p.m. My son was equally astonished! We tried to explain it - was it a search light, was it over Providence Hospital in Newberg? There was no explosion, and no one else put on their car brakes. We checked on-line when we got home, and did not see any immediate reports or hear any later news coverage about this. Tonight I see that others in OR reported sighting what was probably the same "fire ball", they reported seeing it in blue or green, possibly closer to their locations? It was magnificent!! -Betty Thank you Betty! My family and I were driving about a mile north of Neskowin, Oregon when we saw a green object flying east to west. It was rather bright, even though it was seen through tinted windows. It was seen for a few seconds was viewed through a break in the clouds. It had little bits falling off of it, and I thought I saw a little red thing close behind catching up to it. -Linda M. Thank you Linda! Newberg, Oregon time was 8:10 p.m.
Last night I happened to look out a bay window in my kitchen that faces SW and caught sight of a huge blue/green fireball descending in a northerly direction. My first thought was a plane on fire as this is a route from Portland to San Francisco but realized it must be a meteor because of the tail. The size of it was so impressive. The time was 8:10 p.m. We live on a hill or I probably would not have been able to witness this incredible sight! -Ella Thank you Ella! Last night around 8:00 I saw a red glowing object in the sky East of I-5 in Gold Hill, Oregon as I returned from an evening walk up our road. It did not appear to come from the ground, but became visible in the sky and streaked up at an angle from south to north. It only appeared for a second and then disappeared. I was so amazed by what I saw last night that I Googled it to see if I really saw what I saw... At about 8:10pm on 9/21/11 while getting ready to leave the Sweet Home Safeway parking lot I saw a orange ball of fire with a blue/green tail shooting towards the west (slightly north as well). It was VERY bright as I saw it under the Safeway lights. It was moving very quickly. I sat for quite awhile longer thinking I might see more, when no appeared I went home. I am glad to have found this website to report my sighting. I am still moved by the beauty of what I saw, the short instant of being reminded that we are just a dot in the universe. -Rachel Thank you Rachel! Brightness ( in comparison with Venus, Moon, Sun) color, sounds? Extremely bright, at least as bright as a full moon. Started as a bright white and appeared greenish in color as it got closer to the ground. Very bright and quite exciting to see. From my perspective looked to hit the earth, but unable to see an impact so I assume it just went below the horizon line. -Alexandra D.
Coosbay, Oregon Meteor sighting on Oregon coast. 8:10 pdt. Sept 21, 2011. Spinreel Campground 10 miles North of Coosbay Oregon. Directly overhead falling in a NW, 330 degrees falling straight away from us. Were at the beach. Thinking it landed in Ocean. Disappeared over the horizon. Lasting approx. One second. Brilliant bright light. Long blueish white tail. No sound. Thank you. -Jon Miller / Mike. Thank you Jon and Mike. Last night I saw a bright green fireball at about 8:20pm dropping at a steep angle to the SW. It was much slower than any meteors I have seen before. It appeared from the west hills of Portland to be headed directly towards Hillsboro . It was cloudy and so it appeared to be close. Best I have ever seen. -Jeff Van Raden Thank you Jeff! Please email me your location. 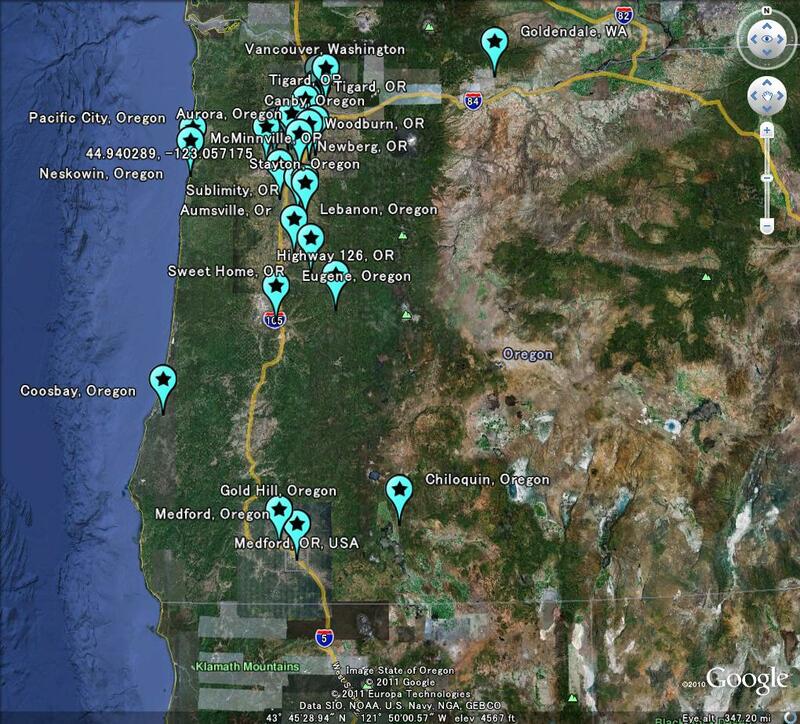 I saw a green fireball just after 8pm while driving south on 99W in North Woodburn, OR. Fireball was seen in southward direction falling to the Southwest. Very bright!-Mike Thank you Mike! Very, very bright -Steve and BETH Jones Thank Steve and Beth! From Sylvan school in SW PDX on 9/21/11 at 8:10 I saw a large green and red streak in the southwest sky: approx 60 degrees, then broke up and disappeared. September 21, 2011 at about 8:15 pm. It was at least as bright as the moon. The light began at about 75 degrees up from the horizon and fell at a slight angle toward the north. As it fell, the light appeared to break up into smaller pieces. Appeared to fall to the horizon, but hills in west Salem and local trees blocked my view I first thought it was the falling satellite coming a couple of days early or that it could be a firework display, but heard no sound. -Greg F. Thank you Greg! Driving home around 8:30 PM PST West on Highway 126; I saw a fireball with an obvious fire trail and the colors were very defined with orange and pale yellow. I watched it quickly fall and the fire went dark. It seemed to have burnt out and I feel it may have been small enough to have landed on the South side of HWY 126 just before the new railroad track bridge in the field just West of Eugene. It was night and my perception may be way off. I was on the phone with my mother when I saw it, using a bluetooth of course. -Jennifer Buchanan Thank you Jennifer! Tigard, OR around 8pm on Sep 21st. We saw what it seems more like a cluster of white balls towards the west, probably above the Pacific Ocean , traveling S-N. It lasted for a few seconds. Hi. I live in Portland OR and last night (9.21.2011) around 8:15pm (pacific) I saw a green flash like an over sized falling star. I was looking to the south from SE 27th and Hawthorne Avenue 97214. It traveled about 10 inches across the sky from East to West. It had to have either been very close or very bright as I was in the middle of the city lights. Anyway hope this is of some use. Thank you for your Blog! Very interesting and informative! -Ciara K. Fox Thank you Ciara! My wife and i were on a walk in Aumsville, Or. on 9/21/2011 at approximately 8:20 PM when we observed a greenish glow falling from the sky to the southwest. As it was falling it seemed to break into at least 3 pieces, we had never seen anything like this and had no idea on how far away it was. At first I told my wife that it could be the satellite that was supposed to be returning to earth. But after further investigation, I see that this was not the case. We were also surprised that there was no mention of the sighting on the local news. -Rod M. Thank you Rod! I also so the blue-green ball falling from the sky just after 8 pm. 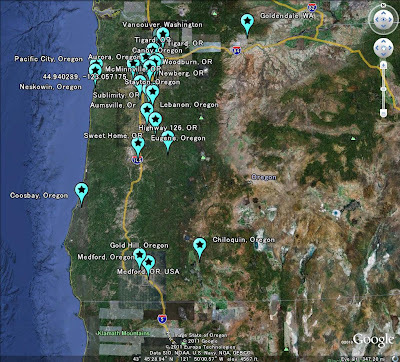 I live just outside of Chiloquin Oregon by Collier State Park which is east of the csscades from the Willamette Valley. It was very beautiful. -Cathy Thank you Cathy! My wife and I saw a large green ball of light travelling in a earthbound arc from east to west in the southern sky. The night sky was clear except the high, thin clouds that partially obscured and magnified it. The visible trajectory was about 1.5 seconds long. It appeared large in the sky, but after reading the other posts, I now realize that it was at least 150 to 200 miles to the south. -Bill Dotson Thank you Bill! I was sitting in my living room and had the door open with only the screen door shut ,Out of the corner of my eye looking towards the west I seen a bright flash of green and turned my head to look out the screen door to see a bright green fireball with what looked like vapor all around it and a very long tail..It was brilliant green...I have never seen anything so amazing in my life..I called my husband and kids into the living room and we all went outside but couldn't see anything else,Darn it.. Thank you, -Rhonda Mangum Thank you Rhonda! time was about ^20:10 Pacific Daylight savings on 21 Sept. Direction was approximately 190 degrees true. Path was 11:00 to 5:00 for approximately one second. Luminosity: similar to Venus--maybe brighter. -Douglas Rexin Thank you Douglas! Last night at about 8:15 I was out walking my dog in Pacific City with a clear view of the ocean from a hillside about 200 ft above Bob Straub park. The night had become foggy, particularly over the ocean. My eye was caught by a greenish ball with a sparkling short tail at about 50 degrees over the ocean. It appeared to flicker out, but because of the fog, I wasn't sure if it just was obscured. It was quite bright...at least as bright as the moon would be on a not quite clear night. It seemed to be about 1/3 the size of a full moon at the apex. It looked much like a flare of rocket that might be sent up on the 4th of July. -Nanci Thank you Nanci! We saw a a large blue green with a tail (meteor, space junk? ),streak across the sky last night around 8:15. We were in Tigard, OR at a stop light. It was going from east to west. It burned out before it landed & I was keeping an eye out for a fire as we were headed west to Newberg. Looked like it would have hit south of Newberg. Hope this helps. -Kathleen Thank you Kathleen! 9-21-2011 I think I saw the same thing these people saw. We were driving home at around 9:30 maybe later, on hwy 18 between McMinnville and Sheridan, going west towards the coast. We just saw this bright ball with a long blue tail went right in front of us almost over us and I would swear it landed in the field right beside us. But my daughter and I went looking for it today and couldn't find anything. It was probably about the size of a basketball. It was going pretty fast. I would like to know if anyone has found this. DEON, Willamina Thank you Deon, Willamina! My name is Bryan Navarro, I'm a reporter with KDRV-TV in Medford, Oregon. We had a call from a viewer describing a similar fireball in the sky at about the same time as the one seen near Lebanon. Just like you, we're trying to track down photos, videos, and witnesses. We'd love to get the word out what happened and would appreciate it if you could pass along any information or pictures and video you receive. We would likely credit your blog with providing the photo, too. Thanks and please let us know! -Bryan Navarro, KDRV-TV ,NewsWatch 12 Thank you Bryan!